I have waited two years to write this. For it was that long ago when this mysterious manuscript arrived on my desk. Mysterious because it came with no letter and even without the name of the author. I could hardly consider publishing it without first agreeing terms with the author. Months passed and still no letter nor clue as to the authorship. I was irresistibly drawn to its content and its strange message. Whoever wrote it seemingly had a very real encounter with the Egyptian goddess Isis, who materialized at the writers bedside. The goddess explained The Being of the Universe, revealing in English her incantations of power. These incantations are simple to recite, requiring no aids or equipment of any kind. Although I felt I still could not publish it, there was nothing to stop me from inviting several interested parties to test these incantations of power. A lady with a stubborn skin problem which would not respond to treatment of any kind found it had completely disappeared within nine days of reciting the Isis Healing Incantation. Ebullient after this unexpected success she thought she would try the Isis Blessing of a Lover Incantation. Though she never had any luck with men she still longed for true love. Within the month she met the kind of man she had always dreamed of. This was some 18 months ago; just last week I received an invitation to her wedding! Another lady, long practised in mystic matters, was keen to try the Isis formula. Her concern was protection of her person, for she lived in an area where mugging was rife. She didn't want to become a victim like two of her friends. She reported a strong reassuring presence. I cant explain it, she wrote, but I do feel it to be very real. When she felt intimidated by the sudden appearance of three unruly youths the threat dissolved when they simply passed her by without rudeness. And this was on an empty street. The Incantations of Isis appear to be expressly for women. Even so, a young man who recited the Isis Blessing For Money won a £10,000 cash prize within ten days. Not only that, but the Isis Incantation For A Career later enabled him to get a highly paid job, which despite previous applications he could never get. 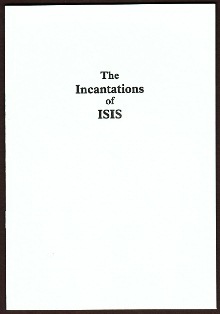 I believe in these Incantations of Isis implicitly. I intend to use all of them, he said. Another man, generally disillusioned with not only the occult but also prayer, was ready to give it a go. I still want to believe, even though nothing has ever worked for me. Visualization was always his stumbling block, finding it very hard to form mental images of what he wants. There is no visualization with these incantations, which is what attracted him. Isis was the most revered of all the Egyptian goddesses. She was also embraced by the Romans who brought her cult to Britain. The Christian church had great difficulty in trying to eliminate her worship, for the goddess was seen as a constant source of comfort and help to those who sought her blessings. to get out of trouble of any kind. for the solution to all problems facing you at present. One of our experimenters gave the Isis Incantation For Self-Assurance to her young niece. The poor girl seemed to have no confidence at all; being painfully shy, hesitant in speech, and easily intimidated. She experienced a total transformation within days of the incantation. It is as if she is a completely different person! She is now so bright and so friendly and outgoing. And although shes not strong on looks she has several boys interested in her  which never happened before! reported her delighted aunt. But how can mere words exert such powerful changes? To the ancient Egyptians the power in words was everything. In the manuscript the goddess herself explains why the incantations work. As to who sent this manuscript, I have no idea who you may be. In any event I have now copyrighted it; you can come forward and claim authorship any time. Doubtless you are an agent of the goddess, and the revelation you received will bring riches and blessings to many.